Hotels and Resorts held the consolidation of tourism destinations and in Seychelles, the message has been clear that the best in Resort Brands are already well established. The islands have managed over the years to attract the brands they wanted, but at the same time encourage home-grown tourism companies to develop unique establishments that have now made a name for themselves. Seychelles has most of the International Brands and they coexist with “homegrown” Seychellois brands such as the Domaine de L’Orangeraie of La Digue Island or the Denis Private Island with its 25 Villas on a 300-hectare island where nature blends is with a sustainable tourism development approach. Both these properties are successful and have become unique selling points of the Seychelles tourism industry because they are unique in their own rights. Their location, the architecture style, and the local knowledge have come together to showcase what is often seen as some of the best Seychelles has. International Brands also find their own place in this developing tourism network. 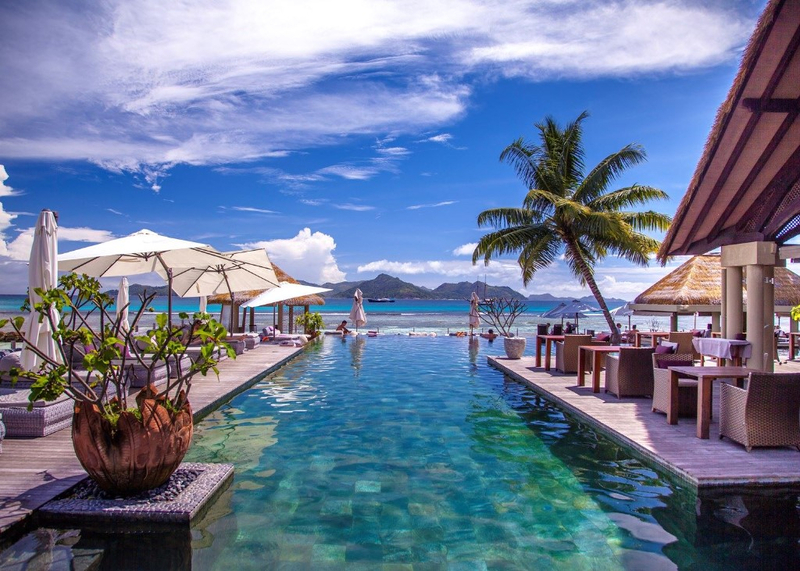 Raffles of Praslin in Seychelles as an example has a location that is unrivaled with the stunning views from all its villas and its main resort structure but a stone throw from Praslin’s white sand beaches. The size of their villas are seen as a home away from home and the Raffles Brand and experience completes the experience. A tourism destination is not and cannot be only its hotels and resorts. The country needs to be what their marketing says they are. This is why the location of tourism establishments play a big role in ensuring a holiday of a lifetime for visitors. It is accepted that a five-star resort or hotel cannot be positioned in a ghetto where people are sleeping on the roads or pavements. The country needs to solve such issues to bring about what is today seen as sustainable an approach. Raising the living standards of the inhabitants of the country, eradicating poverty, cleaning up of the country all go hand in hand with tourism and it can be the vehicle that helps make this happen. Seychelles can be seen today as the benchmark for good and exceptional hotels. They have embarked on the eco-tourism approach and push the sustainable tourism development approach. Seychelles is the brand for its tourism and remains a brand that sits as an example for many to follow.